The Marvel Universe is the shared fictional universe where most comic book titles published by Marvel Comics take place, including those featuring Marvel’s most familiar characters, such as Spider-Man, the Hulk, the X-Men, and Captain America. Captain America is the alter ego of Steve Rogers, a frail young man who was enhanced to the peak of human perfection by an experimental serum, in order to aid the United States government’s efforts to win World War II. 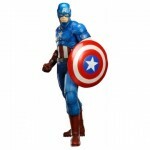 Captain America wears a costume that bears an American flag motif, and is armed with an indestructible, boomerang-like shield that can both be thrown as a weapon and used to defend against others’ weapons.